11 ways to snap out of autopilot and get back in touch with your body. Often we get so caught up in planning and daydreaming and constructing stories that we forget we even have a body. What’s happening in our bodies is as here-and-now as it gets, so take some time to check in and notice your body. It’ll help you pop out of autopilot, develop more awareness, and make better choices. A simple body scan is a great way to tap into the power of your body. Lay down, close your eyes, and get curious about the sensations you’re feeling—like tingling, warmth, coolness, tension—and become intimate with them as they shift and change from your feet to your head. Throughout the day our bodies tend to accumulate stress. Do hourly checkins, taking a deep breath and noticing where tension arises—maybe in the brow, jaw, shoulders, or abdomen. Allow the tense places to soften as you breathe, then stretch and adjust your posture. Listen to the moment-to-moment clues your body gives you about how you’re feeling. By simply noticing these clues, you’ll gradually increase your emotional intelligence—which is your ability to understand and manage your emotions. Social psychologist Amy Cuddy’s research shows us that certain poses can actually increase confidence and reduce stress. Try standing like Superman, with your back straight, chest upright, heart open, and hands at your waist—then hold for two minutes. Our brains are wired to make daily tasks into routine actions so we can focus on novel activities. But when we bring curiosity and awareness to simple tasks, like washing dishes or taking a shower, the mundane comes alive again. Next time you shower, for example, notice how the water feels on your skin, the sweet smell of the shampoo, the sound of droplets falling. It might just be the best shower you’ve ever taken! An essential component of well-being is nurturing a loving heart, and we can use the body to do this. Take one or two hands and place them on your heart, think of someone who makes you smile, and in your mind wish them well. The abdomen is often called “the core” of the body and we can use it for strength and grounding. If you’re feeling stressed or anxious, take one or two hands and place them on your belly. Then take a few slow deep breaths, noticing how they ground you. Most us spend too much of the day sitting, so naturally our bodies get stiff. This encourages tension, stress, and stuckness. By moving your body—changing your posture, opening up your chest, doing gentle twists, or sun salutations—you become more present. A study out of Loma Linda University showed that laughing for short periods of time can help us reduce stress and increase short-term memory. Another study out of the University of Maryland showed that laughter can protect against heart disease. Spend more time with people who make you laugh and doing things that make you laugh. Plus, laughter is contagious, so when you laugh, you are positively impacting the world. Like laughter, a half-smile sends a signal to the brain that something good is happening. Experiment with gently smiling throughout the day and see how it feels. F: Feel any emotions in your body. Ask yourself what you need: To feel safe, to accept yourself as you are, to find inner strength. 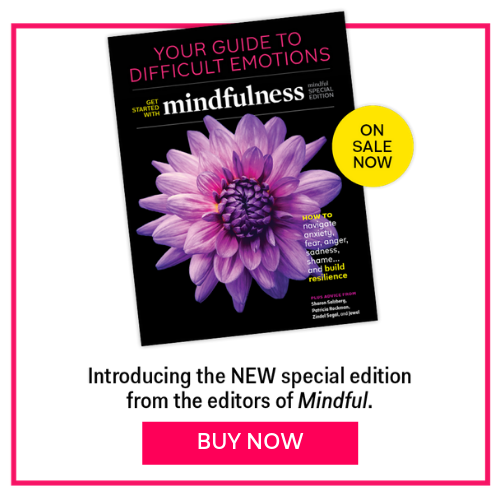 This article also appeared in the June 2016 issue of Mindful magazine.